Once home to the St. Clair Village housing development, Baxendell explained what was in store for the 23 acres during a September tour. 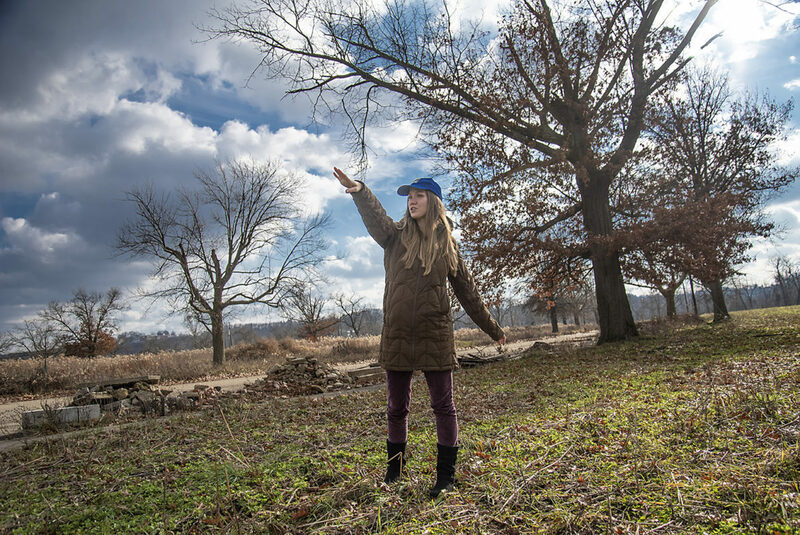 The urban farm, of which she’s the director, will include space for youth education, community gardening and the future farmers market, where residents will have direct access to the local harvest. In cities like Philadelphia, New York City, Kansas City, Detroit and San Diego, empty lots, abandoned city blocks and even rooftops are converted into gardens or urban farms that produce fruits and vegetables. But if all goes according to plan, in 2020, Baxendell will be the project manager of the largest urban farm in the country. St. Clair and eight other neighborhoods represented by the Hilltop Alliance meet the federal definition of a food desert, meaning they lack enough places for residents to buy healthy foods. The Shop ‘n Save in nearby Carrick is the closest supermarket, at a distance of more than a mile. Yet research shows little link between increasing access to healthy foods and comparable change in diets. In other words, adding a lush farm to a food desert may not necessarily change what residents want for dinner. With the difficulty acknowledged, the question remains: What impact can increased access to fresh fruits and vegetables have on resident health? Is a food desert really the problem? For years, nonprofit and government agencies across the country have tried to tackle poor diets and obesity by stimulating supermarket chains to open full-service stores in food deserts, hoping that improving access would also improve diets. It turns out not to be that simple. Tamara Dubowitz, senior policy researcher at the RAND Corporation, studied the impact of dietary habits in the Hill District after a full-service Shop ‘n Save opened in 2013. A 2018 study from Stanford University also showed that the entry of more than 6,700 new supermarkets in low-income neighborhoods didn’t stimulate low-income households to purchase healthier foods. Can urban farms accomplish what supermarkets haven’t? In 2016, researchers from the Johns Hopkins Center for a Livable Future looked at a large body of published literature to evaluate the benefits and limitations of urban agriculture in the United States. They found that urban gardens and farms stimulate social interaction, contribute to greater social cohesion, create opportunities to learn about food production and improve neighborhoods by creating green spaces. They also provide extra income for people who are directly involved in tending the gardens. But what about improved diets and better health? Rather, the report suggests that the benefits of a healthier diet and a healthier lifestyle are mostly limited to community members who actively participate in the gardening or farming. “It should not be like, ‘Here’s a farm that’s producing food, now how do we get people to eat it?’” Kuck said. He warned that integrating an urban farm into a community is a complicated process. At Greensgrow, they emphasize developing relationships and creating opportunities for people in the neighborhood to talk about food, recipes and healthier living. “We like to say it’s not how the people integrate into the farm, but how the farm integrates into their lives,” he said. Philadelphia has an established urban agriculture scene. In summer 2008, researchers counted about 2,000 people growing $4.4 million worth of food across 33 acres in the city. Many of those gardeners — mostly African American and Puerto Rican residents— freely shared their produce with friends and family. Greensgrow Farms began in 1997 on the site of a remediated steel galvanizing plant. In 2018, some 650 members of Greensgrow’s Farm Share program picked up a weekly or biweekly box full of farm products. 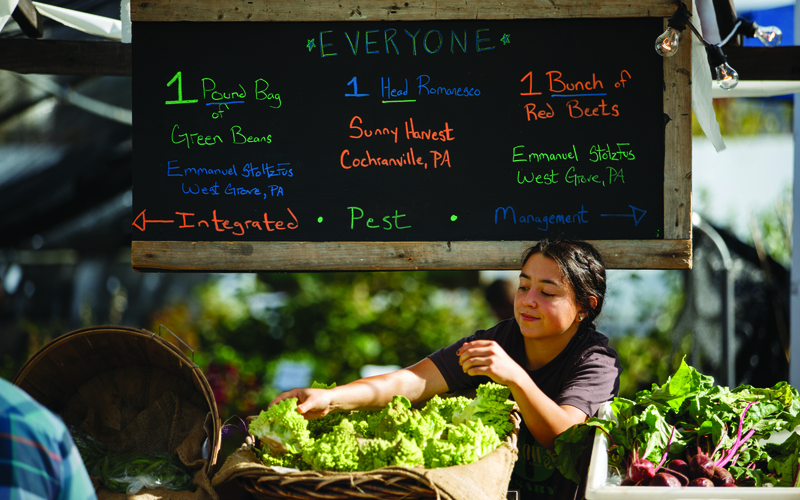 The majority of the food sold by Greensgrow is produced by small farmers just outside Philadelphia. 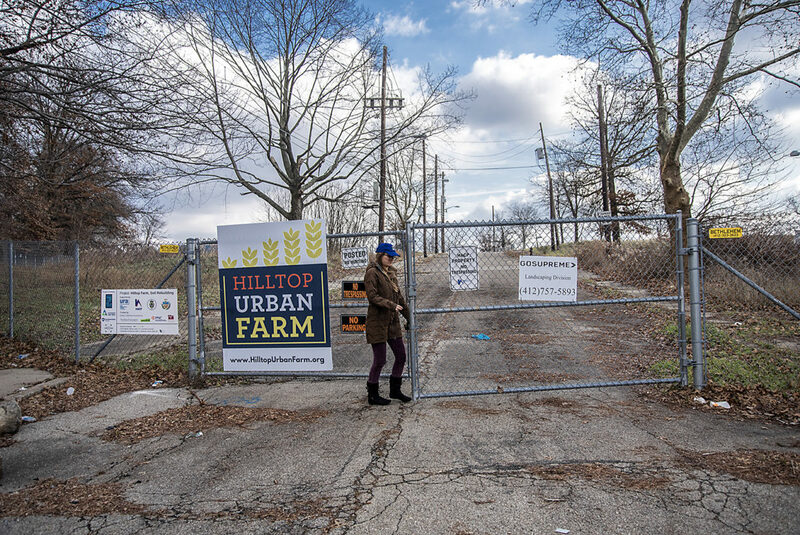 Kuck suggested that the Hilltop Urban Farm build a diverse group of stakeholders. “You have to find ways for lots of people to find value in what you’re doing,” he said. It’s not only about food, but also about creating green space, creating jobs, organizing programs, exchanging recipes and creating a space where people from the neighborhood always feel welcome. Kuck has to balance the interest of his customers with those of farmers, who are often low-income workers. Prices are often higher than local supermarkets, and Kuck said it is important to explain to his customers the benefits of the farm’s produce. It’s local, chemical-free and customers are helping to contribute to a healthier food system. Greensgrow participates in the federal Supplemental Nutrition Assistance Program [SNAP] and other government food programs. The farm’s mobile market sells discounted produce at senior centers and other locations in the city. At the Hilltop Urban Farm, Baxendell will also have to balance the interests of the farmers with the needs of the customers. 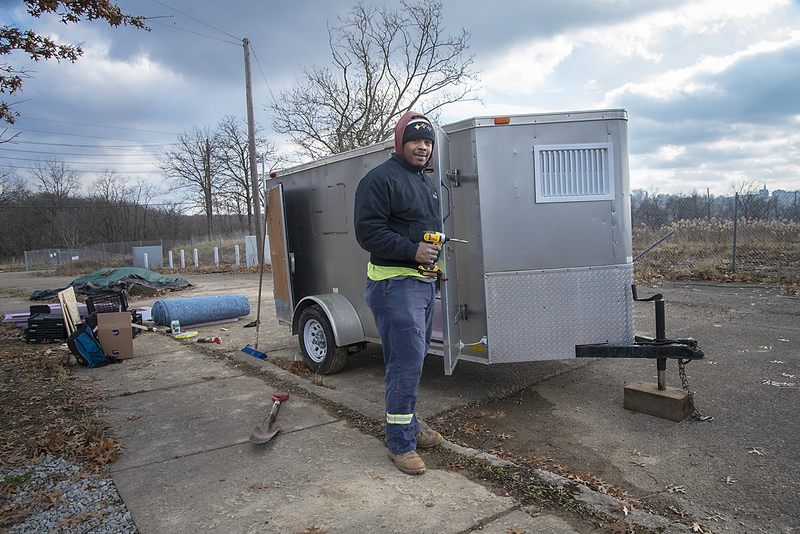 The farm itself will own a number of perennial crops on the site, but the vast majority of the food will be produced by local gardeners who rent small plots of land and by the students in the urban farmers incubation program. “We are developing the first large-scale urban farming training program in the nation,” Baxendell said. This unique three-year program is a partnership with Penn State University. Each student will receive a quarter acre or more to grow fruits and vegetables. All the farmers, including those in the incubation program, will be obligated to sell part of their produce through the onsite farmers market and a mobile produce truck. To build profitable businesses, farmers will be allowed to sell to other customers in the Pittsburgh area. And the price of the produce? Baxendell said it’s unlikely to be cheaper than the local supermarket, but the farmers market will accept SNAP and other benefits. As in Philadelphia, Baxendell explained that organic fruits and vegetables from the urban farm will have a higher quality than those sold in supermarkets. Carrick resident Dolores Mattress, 75, buys her produce at the Shop ‘n Save in Carrick. She said she’s satisfied with the selection and buys most of her produce there. Baxendell hopes to promote the farm’s crops by focusing on youth. Students from nearby schools, along with their parents, will be invited to visit the youth farm, learn about food production and receive healthy snacks to take home. “The kids are probably going home with a couple of peppers and a few tomatoes, having learned how to make pasta sauce or a salad,” she said. Baxendell also wants to partner with Just Harvest and the Food Bank, organizations that already have programs to educate low-income families about healthy diets. Teake Zuidema is a photographer and journalist living in Pittsburgh. He can be reached at t.zuidema22@gmail.com. This story was fact-checked by Harinee Suthakar. With the construction of Shell's ethane cracker plant in Beaver County fully underway, PublicSource spoke to a Shell representative along with seven other people who have different perspectives on the future of our region’s environment and industry. Can Southwestern Pennsylvania’s dams and reservoirs withstand the effects of climate change? Climate change is poised to create unprecedented transformations in precipitation, stream flows and temperature, likely to test the resilience of the system of 16 dams and reservoirs operated by the Pittsburgh district of the corps, which includes the Loyalhanna Dam.